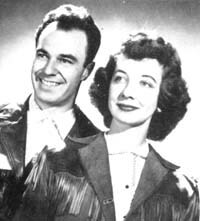 Herb and Kay Adams were a husband-wife duet team that were new on the scene when they started at WLW in Cincinnati, Ohio around 1955. They were both Ohio natives. Herb was a vocalist and played the violin. Kay, who was a native of Greenville, Ohio, played the guitar, did vocals and could also do yodel numbers, too. She was also said to have done some commercials, too as well as a bit of emcee duties. Herb and Kay met when they were featured on a radio station in Dayton, Ohio. Herb Kay, unsurprisingly, were part of the featured talent on the Midwestern Hayride in 1955.